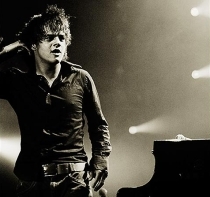 The multi-talented Jamie Cullum is an English pop and jazz-pop singer-songwriter, pianist, guitarist, and drummer. released his first album, Jamie Cullum Trio—Heard it All Before, in 1999, of which 500 copies were made. Due to their rarity, original copies have sold for as much as £600 on eBay! He appeared on Parkinson after releasing his next album, ‘Pointless Nostalgic’ in 2002, which was quickly followed by his third platinum-selling album, ‘Twentysomething’ in 2003. By the end of the year, he was the UK’s biggest selling jazz artist of all time. Since then, he has released more albums including ‘The Pursuit’, which contains the single ‘I’m All Over It’. With a voice like Jamie has, and previous hits including ‘These Are the Days’ and ‘Mind Trick’, Jamie Cullum is a live show not to be missed.